These days, it’s almost a guarantee that the majority of your client base will be checking out your website on some kind of mobile device. Phones, tablets, and Netbooks have become more useful as our lives become more connected 24/7. For your business, this means that your website needs to be just as functional and stylish on a phone as it is in a browser. Duda is a website building and hosting platform that focuses heavily on the mobile aspect of your website, to meet this need head-on. In 2014, Duda was named one of the fastest growing private companies in Silicon Valley, and their focus is on the small business owner who needs to connect with clients around the world. Their two main products, DudaOne and Duda, are designed to serve different needs. DudaOne is a fully responsive website builder, while Duda allows you to create a mobile version of an existing website. There are two ways to use Duda: You can enter a pre-existing website, and then customize the look of the generated mobile site. Duda saves every image and piece of information from your website and puts it all into a template, where you can rearrange and customize. It keeps your color scheme, fonts, and all other design elements, which means that you don’t have to start from scratch. The other option is to build your mobile website from scratch using their templates. 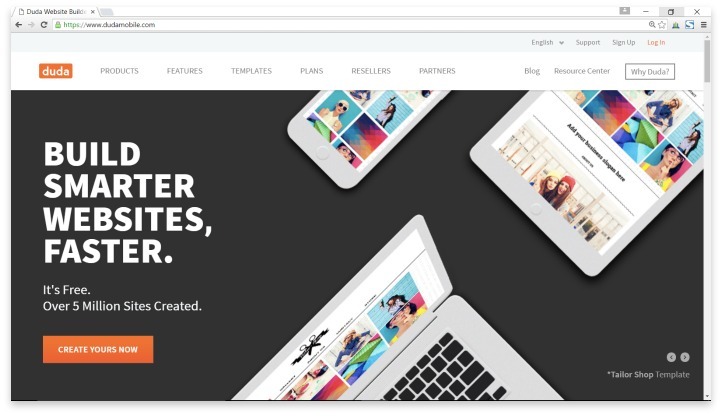 There are only around 40 available, which is exponentially less than many other website builders offer, but the upside is that Duda can guarantee that these templates will work perfectly on every mobile device out there. Android, Blackberry, Windows phone, and iOS are all supported. You don’t need to know anything in particular to use this option, but if you do know CSS3 or HTML, there are tools that allow you to use those languages. There are plenty of useful widgets that you can add to your mobile site, and Duda includes SEO support and allows you to preview your design before you publish. One of the few down sides that can be found is that while there are a few ways to allow you to customize further with HTML or CSS3, for the most part, this is a very basic website designer. You won’t be able to access deep modification tools that you may need for your specific business. The good news is that Duda is very affordable. There is a free option that does include ads, and forces you to use a Duda domain name, but it still gives you all the analytics and basic features you need. The premium version, which clocks in at under $10 per month, gives you a custom domain name, no ads, push notifications, and plenty of great premium features like Click-to-Call, that can make your website even more useful and interactive for your clients. Duda is a website building and hosting platform that focuses heavily on the mobile aspect of your website, to meet this need head-on. If you already have a great website, but your current host just doesn’t have a powerful responsive design, Duda can be a great way to make your website more accessible to even more of your client base. If you’re looking for a brand new mobile site from the ground up, you may find it easier to use a more inclusive service that has better options for customer service. Have you had an experience with this company? Please share your Duda Reviews below.